Junior Starter Kit with Free Bag is the perfect start for every Girl Scout Junior (4th-5th grade) to continue her adventure in Girl Scouting. 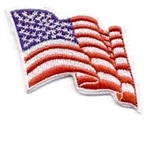 All Girl Scouts age-levels (Daisy, Brownie, Junior, Girls 11-17, and Adult Girl Scouts) wear this pin on the left side of the uniform directly above the Membership Pin on the Insignia Tab. A Girl Scout can choose between this or the Contemporary Membership Pin - Item # 09014. It is worn on the Insignia Tab on the left side of the uniform, centered above the heart.